Shower your dog with some peace and love! PetHangout is snuggling over our dog Pajama – Peace from our Dog Pajamas collection. This lightweight pajama is just perfect for warmer weather. 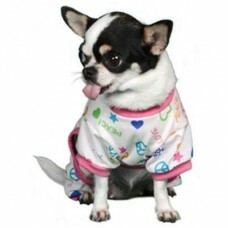 Your dog will be spreading peace and love wherever he goes in this little sleeper. PetHangout has other precious dog pajamas like our Elephant and Owl pjs.